The Pre-Raphaelites exhibition “Victorian Avant-Garde” at the Pushkin Museum of Fine Arts includes paintings from the Tate Gallery in London and works from private collections in in Britain and the United States. The exhibition “Victorian Avant-Garde” has kicked off at the Pushkin Museum of Fine Arts, after five years of planning. The art on display includes works from the Tate Gallery in London and pieces from private collections in Britain and the United States. 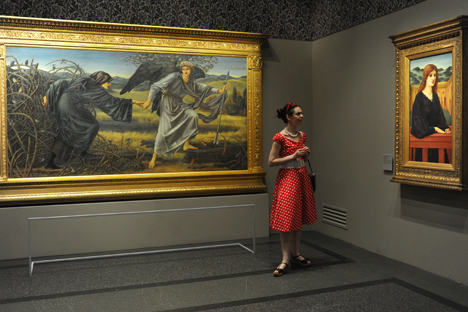 One of the reasons the project took so long to arrange was the high, worldwide demand to see works by the Pre-Raphaelite Brotherhood, the director of the Pushkin Museum, Irina Antonova, told RIA Novosti. “We had to take our place in the queue,” said Antonova, also citing financial issues as another reason. However, she declined to discuss the budget details of the project, which may exceed even the record visitor-numbers for its previous Salvador Dali exhibition. Over the course of 11 weeks, the Dali exhibition was seen by 270,000 visitors. In all, more than 80 works will be shown at the Pushkin Museum, including the obligatory “Mariana” and “Ophelia” by Millais, “Love and the Pilgrim” by Edward Burne-Jones, and the lyric female pictures of “The Beloved” and “Proserpine” by Rossetti. The Pre-Raphaelites are to British art what the Itinerants, or Wanderers, are to Russian art, explains the exhibition’s curator, Anna Poznanskaya. These are the works people know well from childhood. The British brotherhood was formed nearly 20 years earlier (1848) than its Russian equivalent, but they nonetheless shared a common interest in portraying urgent social and moral issues. The young artists of the brotherhood — amongst whom the average age was 20 — gave their association a name that pointed clearly to their artistic direction. They believed their “mentors” were the artists of the era that preceded Rafael: particularly Giotto, Fra Angelico and similar painters of the Middle Ages and early Italian Renaissance. They intended to transform British art (whose achievements they thought had “lagged behind”) and return to the ideals of simplicity, faithfulness and naturalism. From their very earliest works, the Pre-Raphaelites succeeded in their aim in full. Millais’s “Isabella” and Rossetti’s “The Youth of the Virgin Mary” — both stamped with the mysterious acronym “P.R.B.” for “Pre-Raphaelite Brotherhood” — are devoid of perspective and filled with flat female figures and symbols of animals and plants. Although the movement only survived for seven years — the artists went their separate ways after the mid-1850s, and Millais became a full-fledged member of the Royal Academy — the influence they had on the formation of European avant-garde painting, sculpture and design was significant and comprehensive. The Pre-Raphaelites exhibition “Victorian Avant-Garde” at the Pushkin Museum of Fine Arts continues the museum’s program of collaboration with the British Museum, with support from the Arts, Science and Sports Charity Foundation of Alisher Usmanov. The program began in 2008 with an unprecedented exhibition of works by the great landscape painter J.M.W. Turner. That exhibition brought nearly 100 of Turner’s works to Moscow for the first time, resulting in lines of visitors that lasted for hours. The event served to confirm the intense popular interest in British art. British art is poorly represented in Moscow and in Russian museums generally. This new exhibition aims to fill another significant gap by showing works from this unique movement in British art, which set the scene for the Art Nouveau style. Based on materials from RIA Novosti, RBK-Daily and Vedomosti.